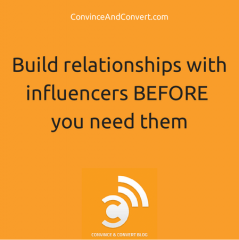 Recently, I participated in a Webinar with my friends at TapInfluence, a terrific marketplace where brands can find and connect with online influencers, and a great sponsor of Convince & Convert. We covered A LOT of ground in this session, so I encourage you to download the slides and/or watch the free Webinar replay. Here are some of the key points. There are eight activities and behaviors that can be tackled by an online influencer. Of course, not all of these eight are right for your brand in any particular circumstance, and one of the tenets of successful influencer marketing is very much understanding WHAT you want influencers to do for you BEFORE you find and recruit them. I still see too much “find influencers” first, with “figure out what to do with influencers” second. Don’t make that mistake. This is simply the hunt and peck method of influencer discovery. Totally doable, but time-intensive and not terribly accurate. Using software to locate influencers based on topical authority, geography or other circumstances. This includes platforms like LittleBird (I’m a proud investor in that great company), and new options like inPowered that finds the top influencers about your brand. This also includes platforms that allow you to not just locate influencers, but contact them as well. Companies like GroupHigh (which writes influencer outreach case studies here on the Convince & Convert blog), and Cision which is the leading software for the PR industry, and a long-standing sponsor of the blog and the Social Pros podcast. These databases are an excellent way to find influencers, and probably give you the broadest possible selection of online influencers. 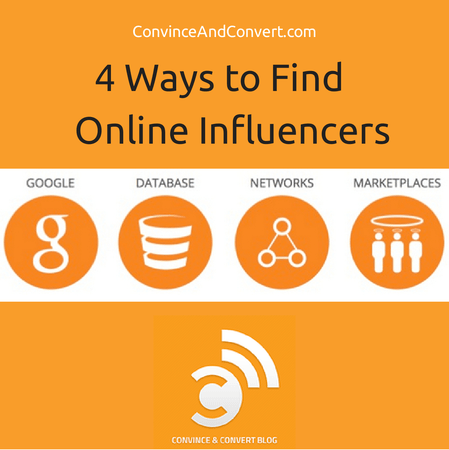 You just need to then approach those influencers yourself, once you identify them. Influencer networks are becoming more and more popular because they minimize the effort that brands need to expend. Influencer agencies, ad agencies, PR firms and start-ups are creating influencer networks that are usually focused on a topic (Dad bloggers, for example) or a platform (Vine creators, for example). Brands can then work with the network proprietor to source influencers, ask them to participate in one of the eight behaviors discussed above, etc. These networks can be a real turnkey option for brands, but of course the selection of influencers is smaller than what you’d find via a database or marketplace. An influencer marketplace (TapInfluence is an example) functions by bringing both sides of the online influencer equation together. Influencers agree to be part of the marketplace and list the types of activities in which they’d be interested. Brands can then match up influencers with their needs, and the marketplace serves as the conduit. It’s a matchmaker approach to online influencers. Regardless of which method you select to find influencers, and irrespective of which of the eight things you want them to do, please remember that the best possible scenario is to build relationships with influencers BEFORE you need them. Your program will be far more effective if you know the influencer and vice-versa than if you are faced with the “our campaign is starting in 3 weeks. we need to find and activate some online influencers right NOW.” Unfortunately, however, that kind of fire drill is still common.